Bloon Tower Defence 6 Apk is an interesting strategic 3D tower defense game. The newest in the Bloons series, it is designed for all Android devices. The title is developed and produced by Ninja Kiwi. You can easily download and start enjoying this game right away. Initially, it was available only as a browser game using the Adobe Flash platform but later some versions of the game series now support Android and other platforms. Here, players get to develop their impeccable defense from the available combination of amazing monkey towers, each of which has a unique array of abilities and moves. You must also keep the towers upgraded at all times, hire special agents. and fight back every invading Bloon. Series of captivating maps and difficulty levels exist which is loaded with challenges and also very exhilarating to play with its simple interface, vibrant new monkey animations, powerful visual effects, and skins upgrades. You basically have to prevent the balloons (referred to as Bloons) on the game from getting to the end of a particular track on a map with one or more entrances and exits for the bloons, using towers as barricade or placing road items that will pop the bloons in different dimensions. Earn money by popping bloons, gathering bananas from the available farms and completing levels. Your earnings can be spent on upgrading of an existing tower or acquiring a new one, or on non-permanent items like road spikes and exploding pineapples. Although, some towers are able to stall the bloons thereby giving more room for the other towers to pop the balloons by freezing and gluing. However, the player’s lives are lost when a bloon reaches the termination point of a path and when the lives are totally lost, the game therefore ends. Bloons have always strived to maintain improved standards and this time with its cool design available for all ages of players for smartphones and tablets. Some of its interesting features include colorful stunning 3D graphics, a fortified bloon property, a new monkey knowledge system, different game modes, obstacles that block a monkey’s sight. Others are, easy to download and play, two new regular towers (the Druid and alchemist), Special challenging missions, and also loaded with more than 50 tracks as well as a 5th tier and 3rd path upgrades for all tower. Bloons fortified property plays the role of a band which strengthens and makes them become super powerful. In this version of Bloons TD 6 comes the introduction of a unique type of tower called heroes which levels itself up and can as well upgrade with no required input from any player. The game only supports one hero per game which have to be selected at the initial stage. The first launch of BTD featured only four heroes while Striker Jones, Captain Churchill, Quincy, Benjamin, Gwendolyn, Ezili and Pat Fusty were subsequently added. Two classes of bloons exist: One is the regular (unnamed in the game) and the other is MOAB-class. While the regular bloons comprise red bloons, blue bloons, green bloons, yellow bloons, pink bloons, black bloons, white bloons, lead bloons, zebra bloons, purple bloons, rainbow bloons, and ceramic bloons; the other type has the shape of a blimp and consist of MOAB (Massive Ornary Air Blimp), DDT (Dark Dirigible Titan), BFB (Brutal Flying Behemoth), the ZOMG (Zeppelin Of Mighty Gargantuaness) and the BAD (Big Airship of Doom). Note that Bloons TD 6 comes with some in-app purchased with real money. However, this can be disabled in your device’s settings, or via “support@ninjakiwi.com” for help. 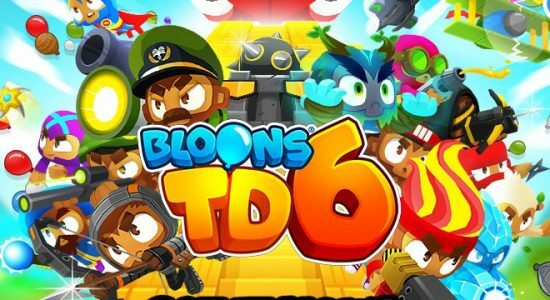 Wait no further; go ahead, download and install Bloons TD 6 Apk on your Android to begin enjoying a thrilling moment on the app! The post Download Bloon Tower Defence 6 Apk [BTD 6 Apk] For Android appeared first on PHONECORRIDOR.